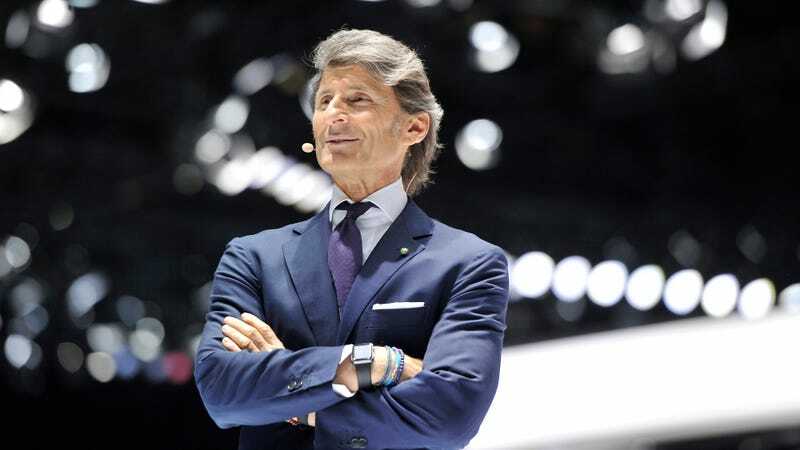 Ex-Lamborghini boss and wearer of impeccable suits Stephan Winkelmann headed up Audi’s fun division Audi Sport GmbH, formerly known as Quattro, for just a little over a year. Now, it appears that he’s moving again, this time to captain Bugatti. That sounds like... trading up. Winkelmann’s initial priorities at Bugatti will include the development and introduction of further [derivatives] of the Chiron, including the rumoured Chiron Grand Sport and Chiron Super Sport. The Volkswagen Group management changes are expected to be made official at the Frankfurt motor show. Winkelmann was CEO of Lamborghini for over ten years after it was acquired by the Volkswagen Group in 1998. He was brought on as president of the company in 2005. In March 2016, he left to lead Audi Sport GmbH. If Autocar’s report is true, then he would not have served there for very long at all. But when Bugatti comes knocking, you answer, I guess. Taking Winkelmann’s place at Audi Sport is Michael-Julius Renz, the former head of Audi’s China sales division. Dürheimer keeps his chairmanship at Bentley for now, but the report says Winkelmann could take that too eventually. In the wake of the Dieselgate mess, Audi is currently embroiled in a management shakeup. Four of its seven management board members have all been replaced. While it’s not clear if Winkelmann has anything to do with that situation, it’s clear pieces on the chess board are being shuffled around. After the scandal broke, there was fear that the Bugatti Veyron’s successor, the Chiron, wouldn’t make it to production. Volkswagen was trimming the fat left and right. But Chiron happened and the world kept spinning. With Winkelmann at the helm, we can probably safely assume that there will be many more special edition/colored Chirons coming. None of them cheap.